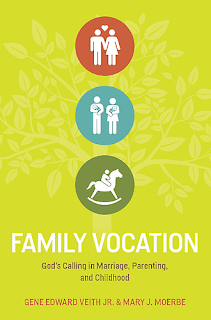 It's taken me a little while to get to Family Vocation : God's Calling in Marriage, Parenting, and Childhood, by Gene Edward Veith and his daughter, Mary J. Moerbe, because Jonathan beat me to the book. I patiently waited for my turn and gathered from him that he mostly liked it (but couldn't be persuaded to write the review this time!) I delved in and so you're going to have to settle for my thoughts. Now, almost right away I feel I have to tell you that neither Jonathan nor myself were overwhelmed by Family Vocation . There were individual chapters which appealed to us individually, but by and large it wasn't our favorite book on marriage and family life. There were things to be gleaned from it, certainly, and we're glad to see a book that is strongly in support of the marriage covenant being placed on store book shelves. There are perfectly horrible options out there for people wanting to learn how to practically apply scriptures to their marriage and home life and this is not one of them. Family Vocation is to be recommended before several other titles that I can think of off the top of my head. (*cough*Eldredge*hack*cough*Parrott*cough*cough*theDriscolls*COUGH*cough*hack!) This book is solid, hard hitting and well-advised. The only reason I'm not waving flags and banners is because there are other books on family that I like more. 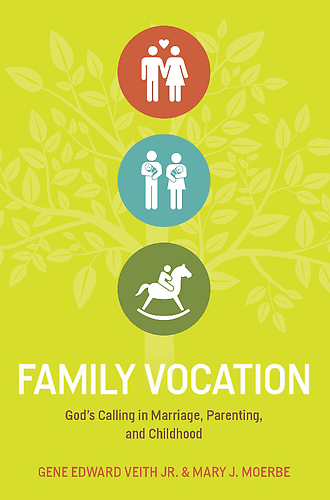 The basic idea of Family Vocation is that every person within the traditional family (one man, one woman marriage) has a calling (or, "vocation") within the nuclear family. Each individual has a role that only they can fulfill and must fulfill to the glory of God. Veith and Moerbe argue that in order for all roles to be satisfied and fulfilled, we must define family as God did (one man + one woman, with children.) In this designed system, God shines through and provides a solid and Biblical example of the gospel message. Instead of assuming that work outside the home is the most valuable, the authors wish to redirect the reader's attention to the relationships which are growing and cared for within the family unit. I really like them for pointing this out as it seems that just because the church may (or may not) have come up with a good Bible study or program, mothers like myself are expected to participate. "Drop your kids off in child care! Attend the Bible study!" are cries I hear all of the time and I am forced to resist. I really believe that my children are my priority in this season of life and while any number of Bible studies might be brilliant and engaging for me, my place is at home - making sure my children are properly cared for. I'm called to be home, ministering to the needs of my little people. That doesn't make me available for every mothers-day-out program or women's Bible study that comes down the pike. It just doesn't. The authors discuss the role of the man as husband and as father and the role of wife and mother. They also discuss the role of children and the importance of growing up inside the security of a traditional family. It was an interesting for me to read, personally. I sometimes felt like I was in complete agreement with the authors and sometimes not. I agree with them in saying that the traditional family is important and that each individual within the family is called to fulfill and support the others in particular ways. Sometimes Veith and Moerbe were a bit more liberal than me in their viewpoints (a fact which a good number of people will appreciate, no doubt!) Most of the time, however, I found myself breezing through the things they shared. Again, it's not that I think this book does not have anything to offer. I speculate that the more liberal-minded Christian might be challenged by the way that the authors approach the subject of male and female roles and that of children. I believe myself to be even more conservative than the authors here and so I didn't find the book quite so challenging or impacting. If I knew that someone was struggling to define what family is or what each member is called to do, I would suggest this book. (I'd also suggest some additional titles to accompany this one.) Family Vocation is certainly counter-culture in that they require their reader to look at the idea of marriage and family through the lens of scripture instead of basing their decisions on feelings and fancies. For this I applaud them. Thank you, Crossway Books, for shooting a copy of this title my way in exchange for my honest opinion. I was actually taking a look at this. Thanks for your thoughts! (Including your little coughing spell!...maybe at some point you can do a favorites post with categories...like favorite marriage/family/parenting/faith/woman books...I am curious...though I have been reading your thoughts for years...and within that you could suggest others to avoid.) :) I think we could definitely do a marriage book soon. Possibly Tedd? Tripp...though we did the video last year or so in Sunday school. What are the books on families that you especially like? I could really launch into a rant at this point about the enforcement of gender roles and the Church's enchantment with a return to a rosy-hued vision of the Victorian upper middle class. I'll mostly bite my tongue. I will, however, state that the larger history of the world has been one where both spouses engaged in hard, often backbreaking labor to provide for the family. Children also became responsible for a share of the work starting at young ages. The luxury of devoting one's time solely to household chores is a modern one - and exists in wealthy societies among those of higher economic status. Because of this fixation on an ideal that has existed in a limited time and place, there is a mindset that there is only one way that is "God's way" to divide up the labor necessary within a family. For women, this has meant a narrowing of acceptable occupations, and an insistence that those who deviate from the template are in sin, not different. For men, this has led to a society-wide belief that we are inferior when it comes to child care or household chores. For a fairly nurturing man like me, that means that I am viewed with skepticism when I am the one that brings the kids on field trips. Heaven forbid I should actually have an opinion on the care of small children. I suppose in that respect, I fall on the more "liberal" side of the argument. Despite Tolstoy's memorable line, happy families are not all alike, and each one needs to find its own division of labor. Each spouse needs to find his or her vocation both within and outside of the family - and it doesn't look the same for everyone. The roles also change as life changes (children age; parents become needy) and as disability or macroeconomic changes affect each spouse's employability outside the home. One of the managers I admired at work had a husband who suffered a severe brain injury so she both provided for them economically, did much house work, and may have to provide care if his capacities decline, as they are expected to do. Our roles depend more on our situation than on our male/female status, other than obvious things like pregnancy and lactation. I'm a lover of Keeping House and one of the things I admire about Peterson is that she is a professor and primary housekeeper both inside and out, since her husband uses a wheelchair. This is an interesting conversation. At this hour of the day (9:30 p.m.) I'm not going to attempt a thoughtful response. :D I AM thinking about the comments though and do have an opinion. As for books I WOULD recommend or especially like - I'll give a thoughtful answer to that soon as well. I hadn't heard of this book nor these authors. I'd be interested in a list of your favorite titles on these categories as well. I'd have to think a while to come up with my own, but as I haven't read any in a while, they'd probably be much older books. I've been thinking I need to read some new ones to know what to recommend when people ask me and to know what the current "buzz" is. I agree with Tim that the way gender roles are played out in every family might be a little different. But the overarching idea that "younger women marry, bear children, guide the house" is a Scriptural one (I Timothy 5:14 and other places.) That doesn't mean that a dad can't take kids to field trips or do household chores (there is a verse somewhere about God's judgment being like a man wiping a dish with a rag, so it is Scripturally ok for me to do dishes. :-) ) Scripture doesn't dictate who takes out the garbage, but the main care of home and children definitely belongs to the wife, and to me that's more than enough to handle without adding an outside job to the mix. And I very much agree with you that my children are mine to raise, not a baby-sitter's, though I didn't have a problem with occasional baby-sitters or church nurseries. I do find it interesting that a whole body of cultural mandates have been built out of one Greek word in I Timothy. As with all scriptural interpretation, I believe it is important to actually look at the context, and not add things that are not there. The context is the instructions given on how to manage the Widows' Fund - essentially a "Safety Net" for elderly widows without family to support them. "As for younger widows, do not put them on such a list. For when their sensual desires overcome their dedication to Christ, they want to marry. Thus they bring judgment on themselves, because they have broken their first pledge. Besides, they get into the habit of being idle and going about from house to house. And not only do they become idlers, but also gossips and busybodies, saying things they ought not to. So I counsel younger widows to marry, to have children, to manage their homes and to give the enemy no opportunity for slander." The problem: young widows who made a rash decision to devote themselves to ministry, but ended up as busybodies instead. What did Paul recommend? Marry, have children, manage their own households instead of meddling with others. The Greek word is related to the word used in the companion section (Titus 2:1-5) which is oikourous. The literal meaning is one who watches or guards the home. I would agree that this gives primary responsibility (and perhaps authority) over the management of the household to the woman. However, I cannot stretch it to mean that this is the sole area in which a woman is to function. In fact, Proverbs 31 clearly contemplates a godly woman supplementing the household income through her labors. Ultra-conservative Christian groups have stretched what is *actually* said into a prescription that all women stay at home, never work outside the home, and never contemplate life or education beyond marriage and childbearing. It takes a twisting of scripture to find that in the actual words of the Bible. Well, as one of the authors I'm disappointed you didn't like the book better. We purposefully sidestepped some of the common egalitarian and complimentarian stances for the sake of a new conversation and perspective. For some of the commentors, "Family Vocation" explicitly commends people for doing what they can to serve one another's needs, which is bound to look different in every case. There is no "shut up and get back to the kitchen" gender stereotyping. There is no demand for women to leave the larger workforce. In fact, perhaps a few of you would be interested in the brief history we included, discussing women's changing roles in the family. Mary J, I am definitely interested in reading the book. Although your name is new to me, I am a fan of Gene Edward Veith. I like the concept you advocate of service in the way each person is gifted. @Barbara - I agree with you. Hence @Tim & Taia - I pointed out that the authors take a little more liberal minded view than myself. As the author herself said, they do not "pigeon hole" people as you might consider others doing. (Others being people like myself.) Rant or rail, I think that God did create man and woman differently and we are designed for specific things, generally speaking. (Haha! How's that for clarity of statement?!) I do believe that within those designed boundaries though, we do see many variations. As Tim likes to point out quite a bit, what works for one family will not work for another. (I would consider Jonathan to be a much better nurturer than MOST men I know anywhere. He takes the kids to well-child check-ups because I can't handle it and he has no hesitations in taking them around town to run errands or explore. He's very family oriented though and I think that's how I'd distinguish him.) I think the roles generally compliment one another and each family is a "team." I'm going to stop there with that subject, for now. As for Mary J's comment - speaking from a blogger perspective, sometimes it's incredibly not fun to review new titles from live authors. (Dead ones don't leave comments if you don't love their books.) It's a challenge because there are so many new titles coming out constantly. I didn't say that I didn't like the book. I just said it wasn't my favorite, but that I'd still find certain situations where I think it could be recommended as a huge help. On the subject of book titles I DO really, really like (or love) - I'm going to create a separate blog post for that. So, I guess, "stay tuned."